KOLKATA: The chief minister of a big Indian state led a sit-in yesterday in a standoff with Prime Minister Narendra Modi’s government over a corruption investigation she condemned as a vendetta, as political tension rises ahead of a general election. Mamata Banerjee, the firebrand chief minister of West Bengal, began the protest overnight in the state capital, Kolkata, after federal police swooped on the home of a police commissioner as part of an investigation into Ponzi schemes that defrauded thousands of small investors. Banerjee, who leads a regional party trying to forge a front against Modi’s ruling Bharatiya Janata Party (BJP), accused the federal government of trying to undermine state powers. West Bengal, which sends the third largest number of legislators to the lower house of parliament, has become a battleground state as the Hindu nationalist BJP looks to make in-roads in the east to make up for any losses in its northern heartland. Hundreds of her supporters gathered at Banerjee’s protest venue yesterday, shouting encouragement. The chief minister sat on a wooden platform, surrounded by ministers and party leaders, and held a meeting of her cabinet. But the Central Bureau of Investigation (CBI), which is controlled by the federal government, said state police prevented its agents from carrying out their work on Sunday and even briefly detained them. “A clash like this, between law enforcement agencies, is not only unfortunate but is also dangerous for the country’s federal and political system,” Home Minister Rajnath Singh told parliament. Modi has to call the election by May. Polls suggest his alliance may emerge as the largest group in parliament but short of a majority. Regional parties like Banerjee’s could play a crucial role in any coalition building. India’s opposition leader Rahul Gandhi said yesterday that his party will introduce a “minimum income guarantee” for the poor if it returns to power in elections this year. 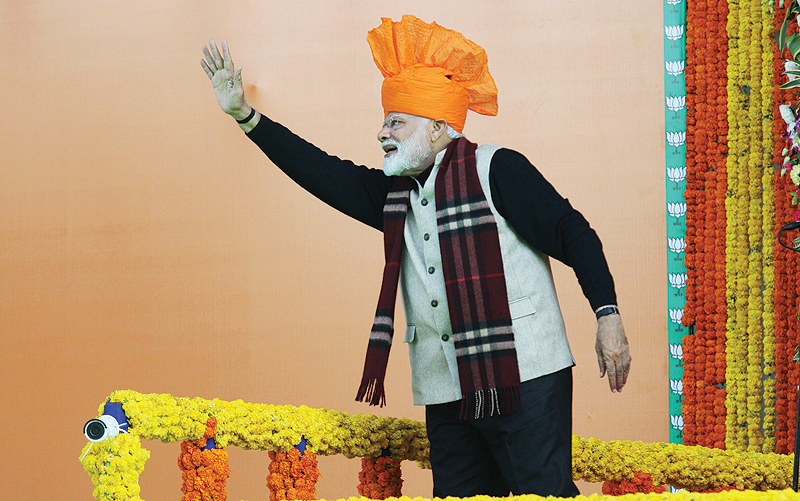 The election, due by May, will see the scion of the Gandhi-Nehru dynasty seek to unseat Narendra Modi as prime minister in the country of 1.25 billion people still ravaged by poverty. “We cannot build a new India while millions of our brothers & sisters suffer the scourge of poverty,” Gandhi, head of the opposition Congress party, said on Twitter. “If voted to power in 2019, the Congress is committed to a Minimum Income Guarantee for every poor person, to help eradicate poverty & hunger. This is our vision & our promise,” he said. Gandhi did not elaborate on his promise but Indian media reported it would be along the lines of universal basic income (UBI), a concept attracting growing interest around the world. UBI — supported by Facebook founder Mark Zuckerberg among others as a way to reduce inequality — involves people being given a flat lump sum by the state instead of subsidies and social security payments.